I got my P1610 about 2 hour ago and the first thing I did is to launch the Vista Ultimate with SP1Installation. But apparently today is not my lucky day. Right when it was completing the installation the system crashed with the Blue Screen of Death. I'm browsing the web to see if anybody had that problem before but so far I have not found anything like that being reported before. I'm reinstalling again to see if I'm lucky this time. If it happen again then I'll try Vista Ultimate without SP1. 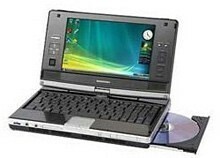 I should receive today my new toy, the Fujitsu P1610, the replacement of my lovely Samsung Q1. The above is the tracking summary of my package. And looking at it I though how inefficient are still our carrier. 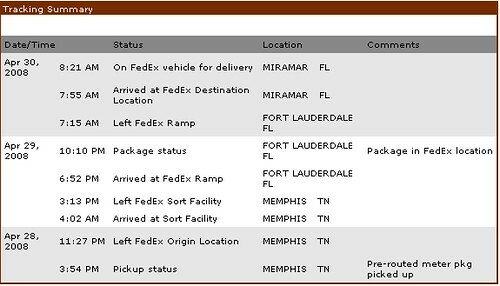 The package arrived to Fort Lauderdale Yesterday and it was sent today to Miramar. The problem is that I live between the two cities, but a lot closer to Fort Lauderdale than to Miramar. So basically, that package passed probably yards away from my house in its way to Miramar! Our friend JKK posted a video review about the Asus Eee PC 900 that I would recommend to anyone thinking of buying this device. There is so much more i would like to share about it, but I hope this is a good start.. oops.. a 35 minute start..
PC Market has shot a very good video review about the new subnotebook from HP, the HP 2133. There are a few things that you can notice on this video and one of them is that VIA needs to work harder in the video chip. In both video tests the CPU load was at 100%. But I also think that probably there was something wrong with that demo unit because in my old eo v7110 (which is for sale now) I'm getting about 80% of CPU load in a regular video and the eo is using a C7 at 1 GHz vs this one that is running a VIA C7M at 1.6 GHz. It should have enough power to run a regular video using less CPU load unless is just not well configured with the right video codecs. The results with the HD video I see in my eo is about the same that you see in this video. Everything started when alltp.com sent me one unit to review. Since then, I have been thinking about how to get a P1610. Yes, I know that the new P1620 has a Dual Core resulting in a lot better performance but the price like in any new toy still to high. So I did not think twice the last Friday when I saw the opportunity to buy a refurbished P1610, with 1 GB of RAM, 60 GB HDD, 6 cell battery and a Port Replicator included for just 960 dollars. The Fujitsu P1610 is just a Swiss Knife. None of the current UMPC in the market can come close to what this device offers. But at the same time you have to be prepare to pay around 2300 dollars if you want the P1610 loaded with 1 GB of RAM, a 60 GB HDD and Tablet PC Edition. One thousand dollars more than what you usually pay for the best loaded UMPC. If you are a professional photographer sending pictures to your news paper you wont find a better companion than this one. It's small but it's powerful at the same time. If you are in a field where you need a powerful Small Factor PC all the time with you, with a Indoor/Outdoor display, the Fujitsu P1610 is what you are looking for. But if you are looking for a companion PC probably you will save 1000 dollars getting a UMPC. But keep in mind, it wont be that powerful. 2300 dollars was too much for me... but $960 that's completely another picture. The P1610 is about the same size of a UMPC with extended battery. Everybody knows that I'm using since almost two years ago UMPCs as my main PCs. My Samsung Q1 has served me well but it's Intel Celeron M is slow in video editing tasks and that's something that I do almost every weekend. Everybody knows also that I have been looking for an UMPC that could bring me a better performance. But currently in the market there are basically two options, either you buy the Samsung Q1U Premium with an Intel Core Solo or you buy a Sony UX. My eyes are not well enough for the UX and I do not like the Q1U Premium - if I'm going to have an integrated keyboard gives me something that really works. Now I'm selling my Q1 and my eo V7110 to pay for my new toy. I'm asking for my eo v7110 $600 (that includes shipping), it was upgraded to 1 GB of RAM and a 100 GB HDD running at 7200 rpm which makes this UMPC faster than any other machine using the same processor. In this price are also included a 6 cells (3 hours) and 9 cells (around 5 hours) extended battery. This unit is using Windows XP Tablet PC 2005 Edition. I'm selling my Samsung Q1 for 700 dollars (Including Shipping), that includes a 6 cells extended battery. This unit is running Vista Business (the original Windows XP Tablet PC Edition 2005 is included) and it has been upgraded to 2 GB of RAM. In both cases, I'm including the original CDs that came with them. In both cases I have been using screen protectors so the screen looks like new in both devices. I was reading CNET News today to find Ballmer's comments about Microsoft's plans to phase out XP this summer. I think that something is wrong with Microsoft's feedback and as MVP I think that I gonna start sending my feedback to them the best I can. So far the majority of people that I talk to and has bought new PCs has downgraded them to XP. I love Vista, that's what I use in my UMPC which is my main PC. But that does not mean that I'm blind. Vista still slow like hell. Vista still have a lot of problems with drivers - I know that this is not Microsoft faults - and this makes it a OS not good for business. Think about it, business do not go crazy every year buying new hardware and basically what I have seen is that OEMs are not going back to create Vista drivers for old hardware, they are pushing businesses to buy new hardware Vista Ready. Even software companies are doing the same. For example, the version of Norton Antivirus Enterprise Edition that I'm using in the company that I'm working for is not compatible with Vista. If I want to switch now to Vista and Windows Server 2008 I have to buy their new version. What for? First of all, I'm not that happy with NA to think about buying a new version from them. In a few words, switching to Vista is painful for Businesses and for some home users. It means not only learning and training people to use a new OS, but buying new hardware and software, expenses that are not needed or just are not smart in a time where USA Finances are not so good. So, either the reports that Ballmer reads every morning about Vista are just lies or he just want to ignore them. Users love XP and users do not like at all Vista. That's a fact that I can't ignore even when I love Vista. It's slow - even with SP1 - and it still have a lot of drivers issues. And it's the last thing I would recommend to any business owner. Almost a year ago I wrote about how my UMPC helped me in a security project that I was working on. So I was not surprised at all when I read today this news today about how thieves used the Asus Eee PC to steal credit card information in Brazil. The cheapest UMPC in town, the Asus EEE PC, has fallen into the hands of three criminals in Brazil, using it to rig ATM to grab credit card information and personal information numbers for cloning credit cards. What is available for the good guys is available too for the bad guys too. Thanks God, as you can see from this news, crooks are not too smart sometimes like in this case. JKK has published a video about his Asus Eee PC 900 unboxing ceremony that I think many will enjoy! Mini Notebook UMPC? What the heck is that? Is not this a Ultra Low Cost PC? A subnotebook? or Just a mini notebook? I'm all confused. A year ago all was clear, UMPC was anything small PC with touch screen of 7 inches or less and a weight of less than 2 pounds. Now everything is called UMPC. And probably to call the original origami devices UMPC was a mistake because anything could be called UMPC. What a mess! Anyway... SlipperyBrick has posted about a new "mini subnotebook" from 3K Computers. 3K Computers has announced a new laptop computer the company considers to fit in the UMPC mold. It is priced starting at around $400 and is known as the Longitude 400 Mini Notebook UMPC. The 3K Longitude 400 weighs under two pounds and sports a seven-inch display. It runs off of a 400 MHz 32-bit single core mobile processor, 512 MB of DDR2 RAM and a 1GB internal flash drive for file storage. The operating system is Linux based as well. 400 MHz processor? No wonder it needs Linux! 1 Gb of internal flash drive! No wonder it needs Linux! If OEMs keep lowing the costs we are going to end with smart calculators in our pockets! Well, now that I think about it, my Pocket PC has a 600 MHz processor so probably we can call this a Pocket PC! What a great honor! To have my blog in the position number 6 in a list created by UMPCPortal, one of the best sites about this topic, and surrounded by names like jkontherun.com and www.gottabemobile.com is something only comparable to my MVP Award received almost a year ago. Thanks Chippy! I know you and I know that you really mean it. That my blog is not there just because we are friends. Thanks again! ...the biggest weakness of the Oqo is the price. 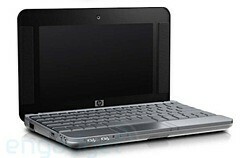 Why someone would opt for the Model 02 instead of, say, the Eee PC, or now HP's Mini-Note, confounds me. The Oqo is $1,300. The 7-inch Eee PC from Asus starts at $399 with Windows XP, and though the keys are tiny, functions more like laptop and isn't that much bigger than the Oqo. The Mini-Note from HP comes with Vista starting at $599. Wow... This is like comparing horses with mules. The OQO 02 is a machine, while these two are entry level machines. They are going to have a market and they are going to be more "popular" if you want to call it in that way but OQO will still have its market share within business and professional users. And that gives me the base for the second news. Vanderbilt University Medical Center (VUMC) is Tennessee’s largest and most prestigious medical facility. A decade ago, its anesthesiologists initiated the development of an easy-to-use, electronic anesthesia documentation solution that has evolved into a comprehensive patient information system specialized for acuity care. Called VPIMS, the solution was developed using Microsoft® software and runs on the Windows Server® 2003 operating system and Microsoft SQL Server® 2005 database software. Using VPIMS, VUMC staff members have been able to improve patient care by having quick access to accurate patient data. The hospital has also improved its bottom line by making staff more efficient, reducing surgery delays, reducing administrative work, and improving billing accuracy. By analyzing data generated by VPIMS, VUMC continues to improve on all metrics (More Information here). And you may ask, what this has to do with OQO. Check the picture on the left. You got it. They have been using the OQO 02 in this project. 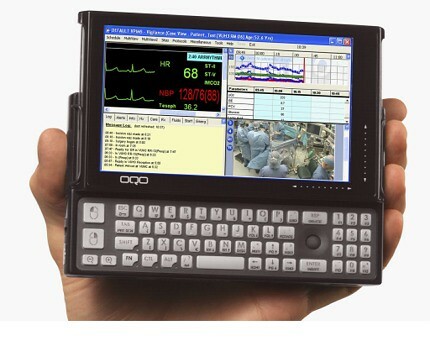 The OQO size, performance and integrated keyboard make them perfect for Doctors to carry them around. Something that would be impossible to do if you are using the Eee PC or Mini-Note from HP. And I'm going to say it one more time, the UMPC market will be dominated by VIA soon and it will keep that leadership for at least a year or even more. All depend of how long will take Intel to design something with enough power to run Vista decently in UMPCs and still getting a good battery life. But so far... it seems to me that Intel is too busy fighting for the MID market. With Hewlett-Packard (HP) said to have ordered 100,000 C7-M ULV processors for its initial mini-note low-cost PC launch, (which is expected to reach 500,000 units in total in 2008) while Gigabyte Technology's new M700 series UMPC (ultra mobile PC) will also adopt VIA Technologies' CPUs, the Taiwan-based chipmaker may have a chance of recover from its long series of losses, according to industry watchers. Forget about buttons, just apply pressure to some places in your UMPC to interact with it. That's Microsoft's idea of the future according to news published at BBC News. Microsoft researchers have been working on force sensing technology that would let you bend/twist/stretch/squeeze your handheld device in order to control it. I still using my Q1 as my main PC and of course to see the picture of the tests being done in one of these machines made my day, I have to confess that. The numbers were originally posted at Eeepcnews.de but I going to link this comment to a very good one posted by my friend Steve at UMPCPortal.com. These figures put the Atom ahead of previous estimates which put the Atom @1.6Ghz at the same performance level as an A110 at 800Mhz. A Samsung Q1 Ultra with the A110 returns 2700 and 3000. Remember that the Atom processor can do hyperthreading. I have no idea what affect it has on the test compared to real-life scenarios. Do you remember guys when I said that the future of UMPC was VIA? Look at these numbers, you can see clearly how Isaiah processor is performing a little bit better than the Atom and of course than the A110. Still, not has good has a Celeron M at 1.6 GHz but I would say that probably better than the one installed in my Q1 at 900 MHz. I know that you guys from VIA read from time to time my blog. And I know that I was a furious critic of your first C7 installed in my old Amtek T700. But... I'm starting to become a believer! So... if you have any demo UMPC using the Isaiah processor around I'm more than happy to check it and write about it. And I considered it a joke because later in his speech he explained how these warnings from UAC were real and were part of a plan to improve independently-developed software. "UAC is changing the ISV ecosystem," he said. "Applications are getting more secure [as a result]. We needed to change the ecosystem, and we needed a heavy hammer to do it." According to Cross, 88% of Vista users have the feature enabled, contrary to the popular belief that disabling UAC is one of the first steps many take when setting up a Vista system. The bottom line is one. Independent developers or freelancer usually do not have the kind of money asked by Microsoft and other companies to certify their programs and that's all it takes to get rid of these warnings in many cases. Taking in consideration that, I decided a long time ago to be part of that 12% that Microsoft talks about. In what group are you? the 12% or the 88%? According to news published today at Products Reviews .NET, Asus is releasing a version of its Eee PC 900 with a Celeron M processor. What happened here? 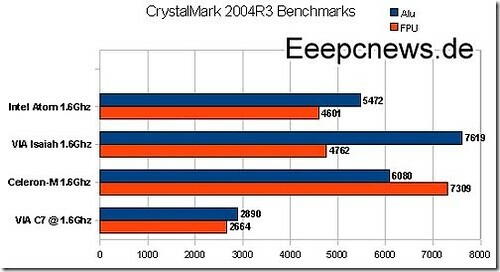 Did Asus find that the new Atom or the previous A110 was not sufficient enough to bring a decent performance to this machine which will ship using Windows XP? 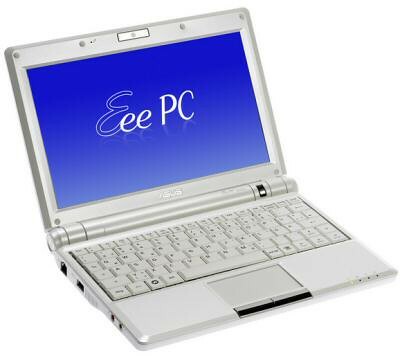 The original Asus Eee PC was a great little UMPC, however many of us knew that this was just a teaser until the launch of the Asus Eee PC 900. We thought that this slighter larger model would be a huge improvement on the previous model however, I was a little shocked to learn that they would still be using the 900MHz Celeron M processor. If you check the title of my comment you are going to notice that I said ULPC and not UMPC. ULPC is a new name that is starting to be used by Microsoft: Ultra Lite PC. In another words, what was used to be known by Subnotebook. Please, do not confuse this with ULCPC, which means Ultra Low Cost PC. The price of this ULPC will be around 500 to 650 dollars and there is not words of when or if it will be sold in USA. Sometime ago I posted a few pictures of UMPC being used in a nursery plant in Spain. Today I received an email with a few pictures showing how UMPCs, in this case the Amtek T770, were being used in a metallurgic industry. In these UMPC they installed an ERP kind of program to control the production, they also loaded them with all the drawings needed during the process going in this way paperless. Without any doubt in my mind, Spain is one of the countries leading the implementation of UMPCs in all production processes, on front of other countries that usually were leaders in the implementation of new technologies. I don't know why there are gadgets that are only released in Japan when they could be best sellers in everywhere in the world. And this could be one of those cases, a new UMPC from Sharp that is going to be only sold in Japan according to news published in CNET Asia. This is another one of those Japan-only products which we can only dream of having. 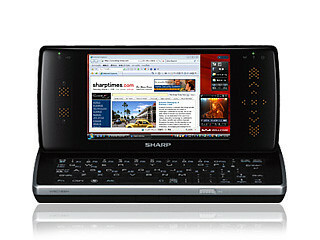 Willcom, an operator there, has just launched the Sharp-made D4, a UMPC based on the recently launched Intel Atom CPU. According to news published today in Engadget, a version of the Kohjinsha UMPC with an optical drive will be released at the end of this month. this 7-incher includes a full-fledged dual-layer DVD writer, which tags along nicely with the 1,024 x 600 resolution LED-backlit panel, 1.3-megapixel camera, 60GB hard drive, 802.11b/g WiFi, Bluetooth and 800MHz A110 processor. It's also filled with 1GB of DDR2 RAM, Ethernet, a duo of USB 2.0 ports, VGA output, audio in / out, 3-in-1 multicard reader and a pair of battery options promising 3.5 / 7.2 hours of life. The 2.4-pound machine looks to be available at the end of this month. 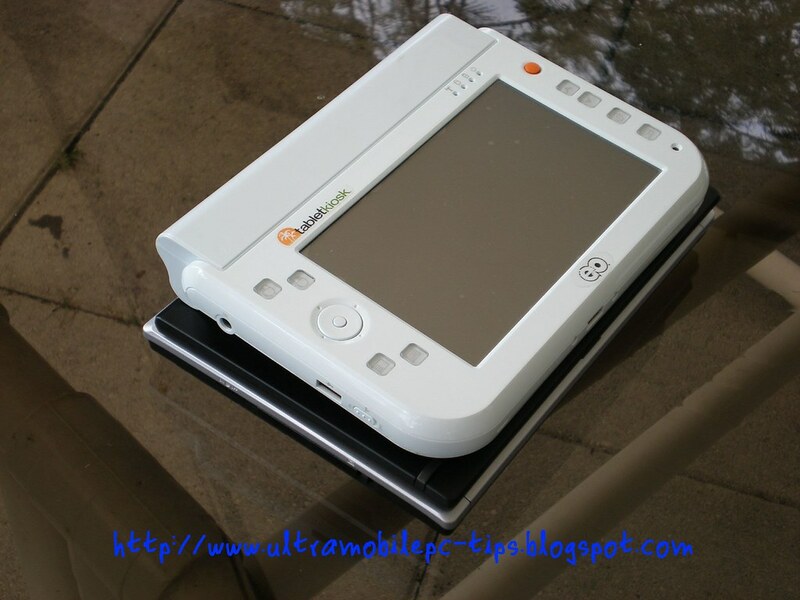 The Kohjinsha is a convertible UMPC that with all these options added weights around 2.4 pounds. 0.4 more than the initial concept for UMPC where the maximum weight should has been less than 2 pounds. Add to that the extended battery and probably will end close to 3 pounds. So... It's a matter of weight against options or functionality. Nobody is perfect. For myself I would go with anything less than 2 pounds. I do need the keyboard, the mouse, neither the DVD so why I should carry them fixed to my UMPC if I can have external ones attached in case I need any of them. 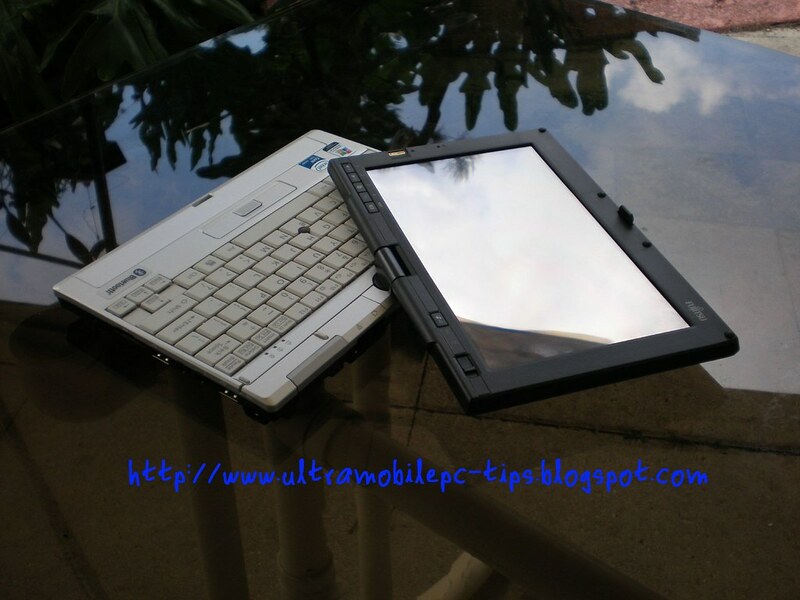 To me UMPC is all about mobility and a key point in mobility is weight. UMPC do not have graphic cards powerful enough for many of the games in the market but still... you can play some. 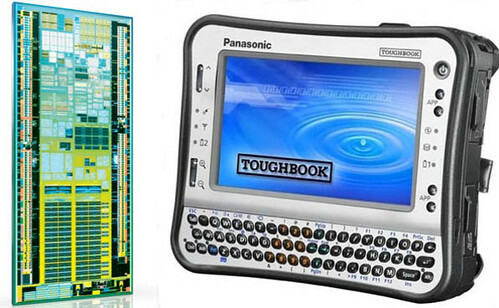 The upcoming Toughbook CF-U1 UMPC is powered by Intel's new Atom processor and seems to fit a wish we asked for last year: Just build a UMPC that is simple, tough, and has a long battery life. The HP 2133 is the latest mini notebook from HP that will be sold in two flavors, 499 dollars with Linux and 599 dollars with Vista. Gottabemobile guys have been lucky enough to have one of the pre production units and have shot a video review of it that I would recommend everybody to watch. While the strengths of the HP 2133 are its mobility, functionality, and configurability, I do have a few niggles. I'm not a fan of the trackpad. Designed to mirror the wide-screen display it is too wide for my tastes and working with the two buttons I'm clumsy at best. I'm also curious as to why there isn't a user configurable option to purchase an embedded 3G solution. But maybe that will come later. The VIA processor on the pre-production model I'm testing performs well once the machine is booted, but initial boot up takes quite some time. Although that may change in the final shipping units. Update: I just noticed that our friends from JKonTheRun also have their own video review. TORRANCE, CA--(Marketwire - April 3, 2008) - TabletKiosk™, a leader in Tablet PC based mobile computing solutions, today announced that it is shipping the GETAC 840XT (g840XT), the company's first full mil-spec rugged Tablet PC, created in partnership with rugged mobile computing pioneer, GETAC. The g840XT is an 8.4" Tablet PC designed for people who require mobility, durability and advanced wireless functionality and that complies with the rigorous environmental requirements of the MIL-STD-810F standard. By incorporating a shock mounted HDD, GPS module, sunlight readable display and fan-less design, the g840XT offers the convenience of a touch screen Tablet PC encased in a durable, magnesium alloy exterior. "We are excited to work with TabletKiosk on this joint project," said Jim Rimay, Vice President of Sales and Marketing for Getac US. "Because TabletKiosk focuses its sales efforts on industries which do not compete with our core markets, the partnership will expand the exposure of the Getac brand." Specifications for this Tablet PC. "The smart design and rugged exterior of the g840XT complements our existing product line," said Martin Smekal, president of TabletKiosk. "Now we can offer our customers the most comprehensive selection of slate style Tablet PCs available anywhere and built for either standard or rugged handling." The g840XT is sold through the TabletKiosk website at www.tabletkiosk.com, as well as a vertically integrated reseller network. TabletKiosk™ is a wholly owned subsidiary of Sand Dune Ventures Inc., a privately held technology incubator. The company produces slate style tablet PCs and UMPCs featuring touch screen and pen input, marketed through an authorized reseller channel and directly through the company website. For more information, visit www.TabletKiosk.com. A few weeks ago analyzing the Intel Atom processors for UMPC I said that to me the future of UMPC is going to be VIA. The announcement of the VX800 Chipset a IGP that works with the newest VIA Isaiah Architecture is pointing to a generation of UMPC using these technologies that will be a lot more attractive to OEMs and buyers. I don't think this is going to bring a performance of a Core Solo but I would not be surprised to see this outperforming the A110, Atom, Intel Celeron M and land with a performance close to a Pentium M.
With every release of VIA you can see a step forward. Something that I don't see on Intel in the last two years where they went from the Pentium M architecture to a weaker Atom. UMPC should be a balance between performance and battery life. And that's what I see in VIA. What I see on Intel is a unbalanced equation favoring battery life and ignoring the performance demands. Which to me is a clear indication of favoring other more weaker device such as MID. Seamless Networking: Makes Wifi connectivity easy, with added support for Gigabit Ethernet networking and 10/100 Fast Ethernet. Extended Peripheral Connectivity: Interconnects up to PCI Express for high bandwidth peripherals, plus hard drive connectivity up to SATA II as well as PATA (IDE), six USB2.0 ports, and four PCI slots. Consumer Electronics Interfaces: Supports the low power device interfaces of SDIO, UART and SPI, as well as for the popular memory card interfaces of SD, MMC and MS for specialist embedded and CE designs. VIA VX800 Unified Chipset: For Even Greater x86 Miniaturization - VIA Technologies, Inc.